My family traveled over the holidays and at one point, we saw a TSA agent with a K9 dog. Thing 2 pointed and said, “look, there’s a dog,” which prompted the TS-9 to hand her a trading card made about the dog, whose name was Hilbert. It was a genius marketing strategy to make kids comfortable and satisfy their curiosity while maintaining their distance and prevent them from approaching or petting the working dogs. tradingcards7 tradingcards8I kept thinking about this K9 trading card and all the fun marketing potential it has. So the other day I tweeted and said, what if we made book trading cards? I liked the idea so much that I then started obsessively figuring out ways to make trading cards and exploring the best tools, as I have a tendency to do. Here’s a look at 5 tools I used, the trading cards I created using them, and then at the end of this post I have a few ideas for ways that we can use the idea of trading cards to promote reading, programs and libraries in school and public libraries. As regular readers know, I am recently obsessed with the Instax Mini camera. I like the wide variety of things you can do with it AND the fact that you get an instant picture. Patience is not a virtue I have and I don’t have a lot of art or tech skills. You can buy a variety of Instax Mini sticker frames, which have a piece that goes on the back of your photo, which helps make this project work. This back sticker makes it so that you can use both sides of the photograph to make quick and easy trading cards. Use a Sharpie marker (I found the Extra Fine tip worked the best) to write on the front and back of your instant photo. You can also use metallic silver Sharpies to write directly on the black back if you don’t have sticker frames. I wrote various facts and gave a rating for my book in the margins of the photo. Here I did an example using the upcoming book Dig by A. S. King. The benefit to this method is that it is seriously quick and easy. The drawback, of course, is that you have to have a couple of Instax Mini cameras on hand, which I recommend. (Did I mention I am a huge fan?) Film is not, however, cheap and I haven’t found it for less than around $0.68 a picture. So though it may be quick, easy and kind of low tech, it’s not in-expensive. The Instax Mini is a fun device, with immediate results and most tweens and teens I know are currently really interested in this device. This is a good starting place if you want easy and immediate results. The trading card that you see in the upper right hand card was made using the Sports Card Pro app, which I downloaded for free. It has in app purchases, but the initial app download is free. I made no additional purchases to create my trading card so the entire product was free to me. Where you see the rocket ship in the left hand corner the Sports Card Pro app gives you a choice of various sports balls to put in that corner. This didn’t really work for me so I saved my picture and opened it in another app, Candy Camera, to add the rocket ship. But if you want a sports theme, you can do it all in this app and pretty quickly. I made the example you see in this picture in about 2 minutes while laying in bed with the TV on in the background and no real experience with the app. I tell you this because I want you to understand how quick and easy it was. One of the things I liked about this app is how much focus it put on the picture, but that left less room for text. It has rigidly set text boxes and design elements, so it doesn’t allow for a lot of personalization or moving elements around. Some people would like this, but I found it frustrating as I wanted to move certain elements slightly in one direction or another and it just doesn’t give you that freedom of design. You could get around this problem by doing the most basic design in this app, saving your card and then uploading it into another app – like Over or PS Express – to add more design elements, but that’s a lot of additional steps and requires some additional knowledge. Because this is a mobile device app, you have to be able to print wirelessly to some type of device. Because I knew I wanted a small, trading card size, I used the Print to Size app on my cell phone which allows you better control over sizing as opposed to simply printing from a mobile device to a wireless printer. I printed to both a regular printer and a Selphy photo printer, which I discuss more at the end of this post. So while this is a good app for designing a sports themed card, it’s not necessarily good for other themes. It was quick and easy, but not very versatile. This is a free online program that has an educational focus, so it has a lot more room for text. You can include facts about the book, main characters, setting, etc. After you go through the generator – which is an easy to fill out step by step form – you download your card as a .pdf and it prints on a piece of letter size paper. Adobe is required to run the program. When you print out your page it comes with instructions that tell you to cut it out, fold it, and tape it closed. It prints in color, but I accidentally printed mine in black and white. If you choose the “Make Your Own” option it allows you to put in your own category headings. Otherwise, the big section headings are pre-programmed, which can be a great feature for younger or newer users. However, it does not seem to allow you to move the various elements or text boxes around, so format wise there isn’t a lot of versatility here either. This is a quick and easy tool, but if you want more personalization or versatility, this isn’t the best tool for you. It’s a really great starting place and will work really well in most school or library settings. I used the format presented in the ReadWriteThink card and a sports trading card I had at home for inspiration to try my final option: Microsoft Publisher, Canva and Google Draw. Each of these programs are publishing programs that allow you the greatest amount of freedom and versatility in how you design and where you place your various trading card elements. You can see the results in the bottom left hand corner of the picture above. Both Canva and Google Draw are basically no or low cost programs that allow you to do freehand design. Microsoft Publisher requires the purchase of a yearly license and it is costly. All three design programs require a certain amount of skill, which most people get just by tinkering around in the programs. I am least well versed in Google Draw and abandoned that medium pretty quickly for something more familiar. I use Publisher and Canva pretty frequently so I was able to produce something I liked pretty quickly and without a lot of difficulty. The final product you see in the picture above was made using Publisher, which I am most comfortable with and, I feel, gives you the most freedom. The Teen and many of the teens I work with, however, are much more familiar with Google Draw and would probably prefer it. After completing my card design I grouped all my design elements, right clicked on my trading card, saved it as a .jpeg and printed it to size. I was able to print 6 cards per one letter size sheet of card stock paper. Saving it as a .jpeg also allows you to upload it and share it on social media or easily transfer it from one device to another, like from my laptop to my cell phone. There are some real advantages to having a .jpeg file versus a .pdf file. All of the options allow you to save and print your trading card in one fashion or another. If you use a freehand graphics program you can save as a .jpg and print on card stock. You’ll want to use card stock to give it the heft of a trading card. If you have the option, I would print to photo paper to give it that glossy trading card look. Although I liked the look of the curved edges for the trading card design, it requires some additional cutting which was harder to make look nice with my questionable scissor skills. I liked the straight lines because I could use a paper cutter and get nice, straight edges. Your mileage may vary. If printing from a handheld device I would recommend using the Print to Size app and printing 2 trading cards side by side on one postcard using the Selphy printer and cutting them apart. This was the method of printing I used in the very first picture of this post. Printing with a Selphy printer or onto photo paper using a traditional printer gives you that glossy trading card resembling finish. If you’re not familiar with the Selphy photo printer, it’s a tool I highly recommend for anyone wanting to print photos from a mobile device. It’s small, portable and has its own built in wi-fi so you can take it with you on outreach events and print immediately from a smart phone or tablet. I reviewed the Selphy printer here if you would like more information. If you like X, read this statements . . .
What to Do with Book Trading Cards? At it’s most basic, libraries could make book trading cards for our favorite or most recent YA titles and hand them out during book talks or at outreach events. Imagine book talking a book then handing each tween or teen a card with a picture of the book cover and a few basic facts about the book so they could remember to ask for it. Wouldn’t it be great to have teens come into the library after a day of booktalking and just hand staff a book trading card instead of trying to remember details about the book you booktalked that they want and hoping that staff can get enough details to get the right book into their hands? This would also be a great marketing tool for the library itself or for specific programs. For example, during National Library Week multi-branch systems could make cards for each branch with basic facts about the branch and hand them out to visitors. Libraries could host some type of challenge inviting patrons to visit as many branches as possible during National Library Week and offering an entry into a prize for patrons who get one card from X number of branches. Beyond using book trading cards as a promotional tool, we could also get tools into the hands of tweens and teens and encourage them to make their own. This activity combines reading/literacy with making, helping us achieve more of our goals. Have a program day where you provide a couple of Instax Mini cameras and some Sharpies and challenge teens to make their own trading cards. Or set up an ongoing station in the corner of your library and make a trading card wall to display teen created book trading cards. Teens could stop in during lunch, study hall or after school and make a quick book trading card and put it on your wall recommending books to their peers. Learning how to use a good graphics program is a valuable skill for anyone, so don’t be afraid to have some in-depth sessions where you teach teens how to use Publisher, Canva or Google Draw and challenge them to design their own book trading cards. Many schools and libraries have tech training labs and this would be a fun project to teach design basics with some set parameters. I have found that many people want some concrete guidelines and examples to begin learning design with and here we would have a built in template to help guide us. And don’t forget that if you want an easy to use template, you can have tweens and teens use the ReadWriteThink trading card creator. Print two of each card, one for participants to take home and one to display on an RA wall or book display. Or print 3 – so they can trade! Depending on what you need, there are pros and cons to each of the various methods used above. Most school and public libraries are already set up to use something like the ReadWriteThink trading card creator and print. This is probably a really good starting point. I highly recommend purchasing a smart phone/tablet and Selphy printer for any teen library space that wants to do a lot of photo based making and programming, but it does require some initial financial investment and the ongoing cost of the specific Selphy paper. You would need multiple devices to have a program, though you can connect multiple devices to one Selphy printer. Or you can set up a small maker station using one device and one printer and allow teens to create as they wanted. Not every teen area or school library has the space or the staff, but if you do a small maker station is a good idea. And in my ideal world, I would write a grant to get 5 to 10 Instax Mini cameras for a teen space or program to do a wide variety of programming things there. You could also just have one and have teens share or set up a maker station using this method as well. Don’t forget to create a hashtag so you can encourage tweens and teens to share their book trading cards online. I made a wide variety of trading cards using all 5 methods over a two-day period. I spent all in all about 3 hours making trading cards. Again, I am a pretty proficient user of both Publisher and Canva so I didn’t have to learn the basics. Each method has its pros and cons and really all of them work pretty well. I liked the Sports Card Pro app the least, mainly because I was not making a sports themed trading card and it required some work around to get rid of the sports themes. As you can see, for my examples I used Thing 2’s Operation BB as a theme for my example cards, mainly because I had those photos readily available on my phone. We did, in fact, print out several of the cards we liked best – the one made in Publisher – and handed them out as a promotional tool and people thought they were very cool. I also uploaded it to the Operation BB social media page. These will, in fact, work really well as fun promotional tools. I had a lot of fun making the trading cards and highly recommend it. A bookstore in Brooklyn has just announced the loveliest new instalment: a poetry gumball machine where all the proceeds go to Planned Parenthood. The bookstore in question is Books Are Magic, a gorgeous independent bookstore in Cobble Hill owned by Modern Lovers author Emma Straub. Their poetry gumball machine is characteristically creative; the poems themselves have been water-colored by hand, and can be bought for a quarter. If you’re lucky, you might even get one of the special coupons that have been sprinkled throughout the vending machine as well! Books Are Magic have long been inspiring visitors to their store with their cute hand-drawn blackboard, on which they write lists such as “Fierce Women in Fiction” and “Fave Siblings in Literature.” It’s clear that everyone who works at the bookstore has a passion for words so strong it’s infectious — and this poetry gumball machine is sure to generate a whole new community of poetry-lovers in Brooklyn. On Instagram, Books Are Magic posted a picture of their first customer’s poem, which was the sweet and quirky ‘This Is Just To Say’ by William Carlos Williams. If you’re anywhere near Brooklyn, you’re going to want to run over to Books Are Magic right this minute and see what surprise poem you end up with — while donating to Planned Parenthood at the same time! Unique independent bookstores like Books Are Magic keep the magic of literature well and truly alive, and creative ideas like this show why these bookstores remain so beloved. I hope that Books Are Magic keep updating us so we can see some of the other poems pulled from their colorful gumball machine! Christopher Eliopoulos, a comic book creator who’s well-known for illustrating the books in Brad Meltzer’s Ordinary People Change the World series, is the talented artist and author behind this fun graphic novel for middle grade readers. Jam-packed with extraordinary hijinks, Cosmic Commandos stars a pair of identical twins who stumble upon a magic ring that allows them to live out a favorite video game in real life. It’s an adventure story that will hook tweens from beginning to end. Middle school is all about fitting in, but Babymouse was born to stand out! What better way to do that than to join film club? With a script in hand, Babymouse sets out to direct their first film … and quickly finds that being a director isn’t as easy as she imagined. Can Babymouse pull it off? With a seamless blend of graphics and prose, this first in a new series promises kids who have grown up loving Babymouse many more hilarious adventures with the lovable character. Alice isn’t at all happy about moving from Columbus, Ohio to boring old Rainbow, Georgia. To make matters worse, she’s been tasked with walking her elderly neighbor’s dog, Clarence, who stubbornly won’t go anywhere without his owner, Miss Millie. Set against the backdrop of the late ’60s, a friendship forms as Alice learns about Miss Millie’s life, including the tragedy and loss she has suffered at the hands of racism. As Miss Millie unravels her story, she shares the ways in which she has overcome pain and anger; sets an example of kindness, generosity, and positive spirit; and inspires Alice to address her own feelings of loss along the way. This middle grade novel, set in Los Angeles in the summer of 1965 and inspired by real-life events, is already earning a host of starred reviews from the likes of Kirkus, Publishers Weekly, and School Library Journal. Twelve-year-old Sophie’s life changes when she and her family become the first African Americans to move into their new neighborhood. When riots erupt in nearby Watts, Sophie is forced to think about her place in the world in a whole new way. Balancing humor and a host of relatable issues, English has written a thoughtful and moving coming-of-age tale for tweens. See how it all wraps up in the final tale in author Chris Colfer’s bestselling Land of Stories series. Things are chaotic — all of the Land of Stories fairy tale characters are no longer confined to their world. Connor and Alex will have to try to win their biggest battle yet and restore order. Expect laughs, plenty of action, and a little sadness that this is the end. From the author of the New York Times bestseller Women in Science comes an awesome new anthology featuring fearless females. This time the focus is pioneering female athletes. Ignotofsky highlights the stories of 50 women from the 1800s through today who soared to great heights and broke new ground. Tweens can read about all kinds of athletes — from the well-known gymnastics star Simone Biles to the lesser-known skateboarding pioneer Patti McGee. A great addition to any tween’s bookshelf. Ellen Oh, the author of the YA Prophecy series and cofounder of We Need Diverse Books, launches a new mystery series for middle grade readers with this riveting first installment. Harper Raine’s family just moved into a new house that she’s starting to think is haunted. When her younger brother begins behaving oddly, she knows she has to step in and figure out what ghosts might be hiding in their home. Popcorn Reading: A student reads orally for a time, and then calls out “popcorn” before selecting another student in class to read. Combat Reading: A kid nominates a classmate to read in the attempt to catch a peer off task, explains Gwynne Ash and Melanie Kuhn in their chapter of Fluency Instruction: Research-Based Best Practices. Popsicle Stick Reading: Student names are written on Popsicle sticks and placed in a can. The learner whose name is drawn reads next. Touch Go Reading: As described by Professor Cecile Somme, the instructor taps a child when it’s his or her turn to read. Why all the harshitude? Because Round Robin Reading . . .
Stigmatizes poor readers. Imagine the terror that English-language learners and struggling readers face when made to read in front of an entire class. Weakens comprehension. Listening to a peer orally read too slowly, too fast, or too haltingly weakens learners’ comprehension — a problem exacerbated by turn-taking interruptions. Sabotages fluency and pronunciation. Struggling readers model poor fluency skills and pronunciation. When instructors correct errors, fluency is further compromised. To be clear, oral reading does improve fluency, comprehension and word recognition (though silent/independent reading should occur far more frequently as students advance into the later grades). Fortunately, other oral reading activities offer significant advantages over RRR and its cousins. As you’ll see in the list below, many of them share similar features. The teacher and class read a passage aloud together, minimizing struggling readers’ public exposure. In a 2011 study of over a hundred sixth graders (PDF, 232KB), David Paige found that 16 minutes of whole-class choral reading per week enhanced decoding and fluency. In another version, every time the instructor omits a word during her oral reading, students say the word all together. Two-person student teams alternate reading aloud, switching each time there is a new paragraph. Or they can read each section at the same time. The Peer-Assisted Learning Strategies (PALS) exercises pair strong and weak readers who take turns reading, re-reading, and retelling. For added scaffolding, frontload silent individual reading with vocabulary instruction, a plot overview, an anticipation guide, or KWL+ activity. This activity, says Julie Adams of Adams Educational Consulting, is “perhaps one of the most effective methods for improving student fluency and comprehension, as the teacher is the expert in reading the text and models how a skilled reader reads using appropriate pacing and prosody (inflection).” Playing an audiobook achieves similar results. Students “echo” back what the teacher reads, mimicking her pacing and inflections. Chris Biffle’s Crazy Professor Reading Game video (start watching at 1:49) is more entertaining than home movies of Blue Ivy. To bring the text to life, students . . . Play “crazy professor” and “eager student” in a hyped-up overview of the text. Kids practice orally reading a text in preparation for reading to an assigned buddy in an earlier grade. This activity can aid fluency, according to literacy professors Katherine Hilden and Jennifer Jones (PDF, 271KB). After an instructor reads (with expression) a short text selection appropriate to students’ reading level (90-95 percent accuracy), learners read the passage silently, then again loudly, quickly, and dynamically. Another kid graphs the times and errors so that children can track their growth. The teacher reads aloud while students follow along in their books. The text is taken home if more practice is required, and extension activities can be integrated during the week. I hope that the activities described above — in addition to other well-regarded strategies, like reciprocal teaching, reader’s theater, and radio reading — can serve as simple replacements to Round Robin Reading in your classroom. Tell us your favorite fluency or comprehension activity. 2016 seems to be the year for final books in series being released. It can be hard to keep track of so we’ve put together a compilation of some well-loved or highly-anticipated series that you should check out if you haven’t already. Not all of the finales have been released just yet, but this is a great time to start reading so you’re all caught up when the final book is in the world! I somehow missed the boat when The Raven Boys first released in 2012, and suddenly the fourth and final book, The Raven King, has just been released. I just started reading book two in the series and I’m really enjoying them. Maggie is a natural storyteller and I’m excited to see where this exciting, paranormal series goes. This is another series I missed when the first book came out but now that the duology is complete, I’m looking forward to reading it. This is a fantasy spin on the wish-granting genies that exist in mythology. I loved Jessica Khoury’s Aladdin re-telling The Forbidden Wish and this seems like a natural choice to pick up next. In a sense, this could be considered two separate series. But as The Heir and The Crown are spin-offs of the original Selection trilogy, it’s truly the end of America, Maxon, and Eadlyn’s story. I’ve got the final book, The Crown, on my bookshelf and all I need are a few more hours to finish the series. If you haven’t checked out this dystopian version of The Bachelor meets The Hunger Games, what are you waiting for? If you’ve missed this series, it’s safe to say you might have been living under a rock for the past year. The post-apocalyptic series has aliens and a strong female lead character. The 5th Wave was even released as a movie starring Chloe Grace Moretz in January 2016. The third book in the trilogy comes out next week, so you’ve still got time to catch up before spoilers begin to show up on the Internet. The final book in The Winner’s Trilogy recently released to extremely high anticipation. Marie Rutkoski’s series is probably one of the most hyped series that I still need to read. Now that it’s complete, it’s a great time to pick up the books and binge read them one after the other. This fantasy duology is now complete. Jodi Meadows tells a story of magic, spies, and royalty inThe Orphan Queen and The Mirror King. According to Goodreads, it’s “a vivid new fantasy full of intrigue, romance, dangerous magic, and one girl’s battle to reclaim her place in the world.” This is perfect if you’re looking for fantasy series that doesn’t require years of commitment! Jennifer Lynn Barnes is one of my all-time favorite writers. She has a skill for crafting mysteries/thrillers that have you on the edge of your seat and keep you guessing up to the very end.The Naturals series tells a story of teens with special talents that are put to use solving FBI cases. The most recent book, All In, revealed that things are not how they’ve seemed. Bad Blood is set up to be an intense, heart-pounding finale to a fantastic series. “On the mysterious island of Nil, the rules are set. You have one year. Exactly 365 days–to escape, or you die.” If that doesn’t intrigue you, I’m not sure what will. It sounds like The Hunger Gamesmeets Lost meets Lord of the Flies. 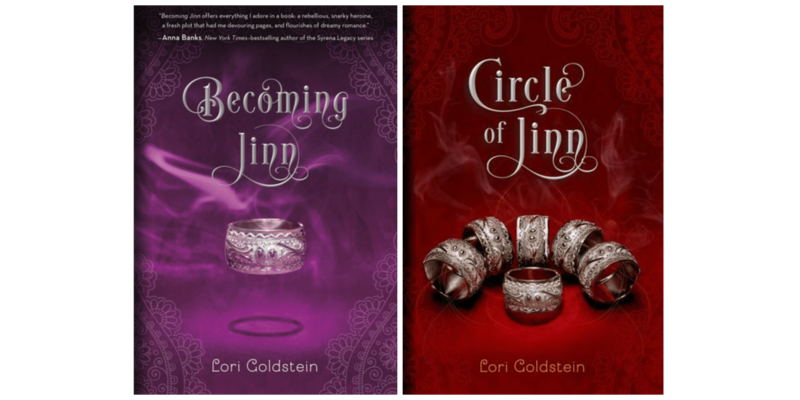 The third book in the Nil trilogy comes out in two weeks, so you’ve got plenty of time to read the first two books. This is one of my most anticipated series finale’s this year. Claudia Gray has created an incredible world that spans different dimensions and characters that I love and want to protect. The mix of fantasy, sci-fi, mystery, and world-threatening stakes have me incredibly excited for A Million Worlds with You. If you haven’t read this series, why not? Heist stories are my favorite (need proof? Check out my obsession with Heist Society, anything else by Ally Carter, and now Six of Crows). 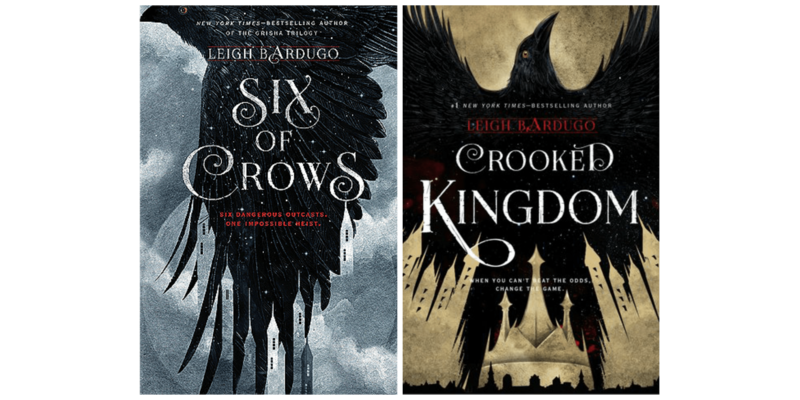 In my opinion, Six of Crows was one of the most beautifully crafted stories of 2015. The cliffhanger-esque ending is brutal and I am absolutely dying for Crooked Kingdom to be released and sitting on my bookshelf. I am so ready for the ending of this duology, but I would also love to see more heist stories in Kaz’s world from Leigh Bardugo. Setting reading goals for yourself and the children in your world is a fun way to open a world of possible each year. The reading challenge that I tried in 2015 pushed me to read more adult books and genres that I don’t hit that often. This year, OOMers’ reading resolutions cover our reading habits, genres, and methods, as well as how some of us will track our progress using checklists, spreadsheets, or websites. We are making the challenge of achieving your reading goals even more fun in 2016 by turning it into a game –the Scholastic 2016 Reading Bingo! Download the PDF for the Scholastic 2016 Reading Bingo board. See which descriptions/squares the book matches. Write the name of the book in the square or, for a fun visual, print out a small image of the book’s cover and paste it in the box. Repeat steps 2-4 several times. Once you fill in a row vertically, horizontally, or diagonally – yell “BINGO!” nice and loud. If you really want to challenge yourself, read 49 unique books and complete the whole board! I already got started with Matt de la Peña and Christian Robinson’s 2016 Newbery medal winning picture book Last Stop on Market Street in the center square and Laura Resau’s middle grade novel The Lightning Queen in the top row. We’d love to follow your progress if you want to share your reading bingos on social media; just use the hashtag #ScholasticReadingBingo ! Challenge your students and library patrons to play!